CRUNK!!! Energy goes beyond your typical energy source brands because it's naturally fueled* with a powerful proprietary blend of energizing herbs and antioxidant rich botanicals. There's really nothing else like it. All CRUNK!!! Energy products are uniquely crafted from juices and real fruit flavors. No artificial preservatives. No artificial flavors. No artificial colors. High-quality ingredients help to ensure the extended shelf life of CRUNK!!! Energy. But the difference doesn’t stop there; our dynamic formularies all include a proprietary blend of natural stimulants, antioxidant-rich botanicals, and adaptogens like Ashwaganda, Skullcap, Guarana, Ginseng, White Willow, Horny Goat Weed, Grape Seed Extract, and Milk Thistle. That’s what’s up. It’s all good! 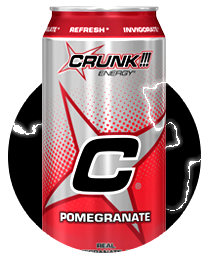 There’s no better way to quench your thirst than with CRUNK!!! Energy, because it’s legit great tasting hydration that’s backed up by a super-powerful blend of energizing and immune boosting herbs. What can you do with CRUNK!!!? CRUNK!!! Energy was born in 2004, by renowned sprits entrepreneur, Sidney Frank. The challenge was to craft a quality energy supplement that embodied an edgy and uninhibited style infused with Sidney Frank’s radical, trailblazing business savvy attitude. The result was iconic: CRUNK!!! Energy. Believe the hype! CRUNK!!! Energy has emerged as a powerful force in the energy category by distinguishing itself in terms of flavor profiles, naturally fueled ingredients and patented herbal and botanical formularies. CRUNK!!! Energy maintains distribution throughout the Southeastern United States and is working hard to expand distribution every day. We know how to hustle. CRUNK!!! Energy is currently sold in these states: Georgia, Alabama, Florida, Mississippi, Louisiana, South Carolina, Ohio, and Tennessee. And CRUNK!!! is available online at our web store and retailed on Amazon.com.